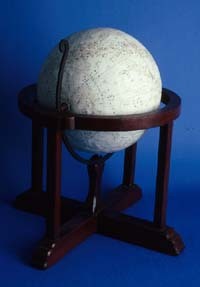 A celestial globe from the Whipple Museum. Celestial globes were used to represent the stars and constellations of the night sky and record their positions with respect to each other and a co-ordinate system. They were also used as analogue computers to resolve problems involving the stars. In the most common form of celestial globe, a number of stars were marked on a sphere, and the constellation figures delineated. The sphere was mounted by its poles (corresponding to the celestial poles) on a metal circle, or meridian. The ecliptic and equator were marked and divided (into degrees) on the globe, to measure celestial longitude and right ascension. Declination was measured using divisions marked on the meridian. The globe was placed in a stand, which included a broad horizontal band, known as the horizon. The elevation of the pole of the globe above the horizon could be varied to adjust for the user's latitude. Once so adjusted, the rotation of the globe was analogous to the (apparent) diurnal rotation of the stars, for that latitude. Since the ecliptic and equator are marked, the globe could be used to work out the times of rising and setting of the stars, or the time of their culmination (the time when an object reaches its highest point in the sky). Ptolemy, Almagest, Book VIII, 3. Translated by G. Toomer, Ptolemy's Almagest (London, 1984), pp. 404-407. Adams, George. A treatise describing the construction and explaining the use of new celestial and terrestrial globes, 4th edn. (London, 1777) and subsequent editions. This page is Copyright 2000, Kemal de Soysa and the Department of History and Philosophy of Science of the University of Cambridge. All Rights Reserved.